Bonefish Flies Work for Striped Bass? ”My fly box includes Gotchas, Crazy Charlies, Clouser Deep Minnows, and a very little-known Lefty Kreh pattern called the Shallow H2O. 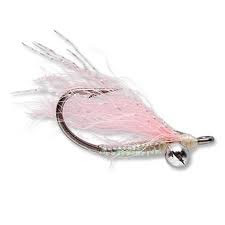 This has been a go-to fly for many years for schoolies in and around shallow eelgrass while they are eating shrimp. A few times, keepers taking this diminutive fly surprised me.